Look what David made for me!!! I mean, for the garden!!! 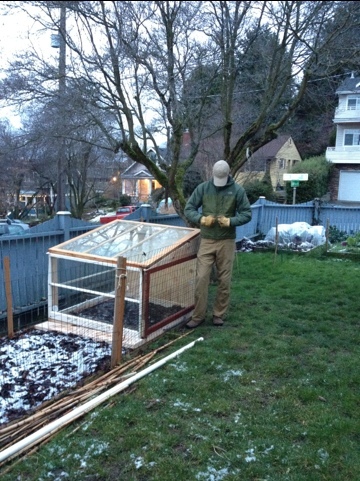 From the used windows we got at the Ballard Re-Store and some lumber, we have fashioned a ginormous mini-greenhouse that fits over the 4-foot-wide raised beds in the garden. It’s heavy and unwieldy, but it’s made from mostly recycled material that cost us, oh… maybe 50 bucks? The windows are way cheaper than the wood, heh. In any case, it’s fantastic and i can’t wait to get some planties in there. 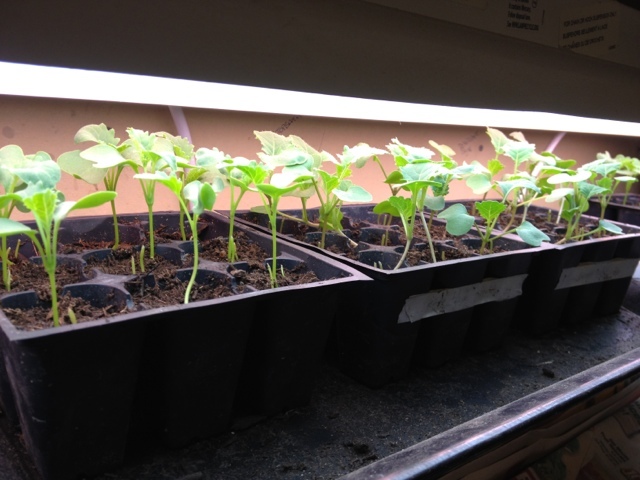 It’s currently squatting over the section of the 2012 brassica bed that will grow kale (pictured below growing in the apocalypse room). I’m hoping it will warm up and dry out the soil enough in the next week that i can transplant the kale seedlings out there, but we’ll see. (The kale seedlings that Kate and i transplanted into the front yard a while back got obliterated by slugs- i forget that while fallen leaves shelter the soil, they also provide good slug habitat, and little seedlings can’t out grow them in the cold weather.) Before transplanting this time, i will rake up what’s left of the leaf covering and give it to the chickens; it’s likely FULL of bugs. 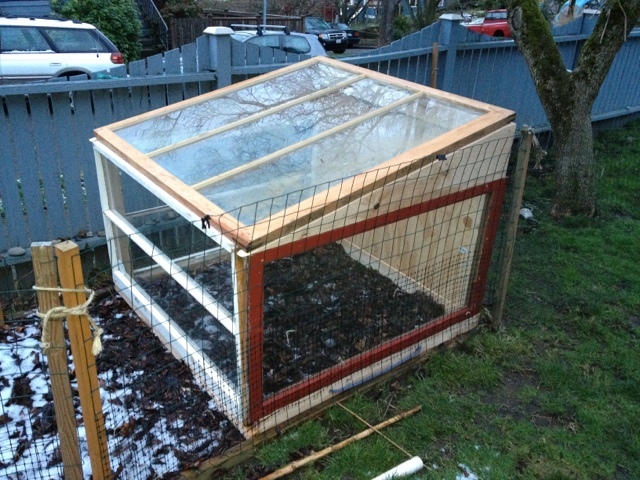 We have plans and materials for another 4ft-wide by 3ft-long by 1.5-2ft-tall mini greenhouse, and three cold frames of various sizes that will be just tall enough for lettuce and other greens. Between all of them, we should be able to start everything waaaay early this year- but we’ll see how things work out. The tall mini green house will eventually be used to protect a few early tomato plants, and then we’ll likely shift it over to the cucumber/squash/melon bed. Eliot Coleman, whose book Four Season Harvest i have, describes a neat system of movable greenhouses that protect cold-hardy plants over the winter, then move to less hardy plants, then tomatoes, then squash as each plant needs protection and the previous one will be ok uncovered. The most interesting part is that he does this backwards also- the greenhouse goes back over the squash near the end of summer, when the squash are done the greenhouse moves to the tomatoes (which would be great in Seattle, since it’s the sogginess that gets them as much as the cold), and in November or so when the tomatoes are done, the greenhouse moves back to protect the overwintering veggies. He manages all this in Maine, so i imagine it will work alright in Seattle too. Although, his theory is that it’s the amount of sunlight that counts (as long as you can protect your plants from the cold), and so while he’s at the same parallel in Maine as Southern France (which is much warmer), both of those places are at lower latitudes and get more sun than we do here. David poses next to his handiwork, indicating that it takes mad muscle to lift this thing. 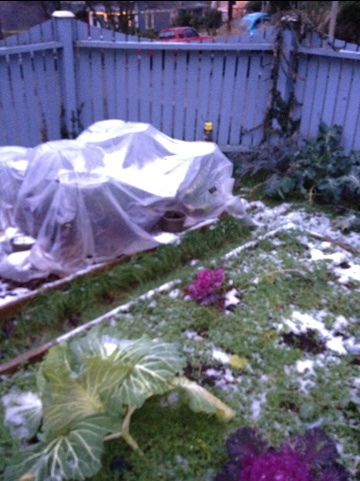 Meanwhile, the chard is under the plastic “tunnel”, and the cabbage, kale, and broccoli are out weathering the storm nekkid.